Today I'm back with another yummy recipe, these oatmeal caramel crumble bars are perfect for an on the go snack or even for breakfast! 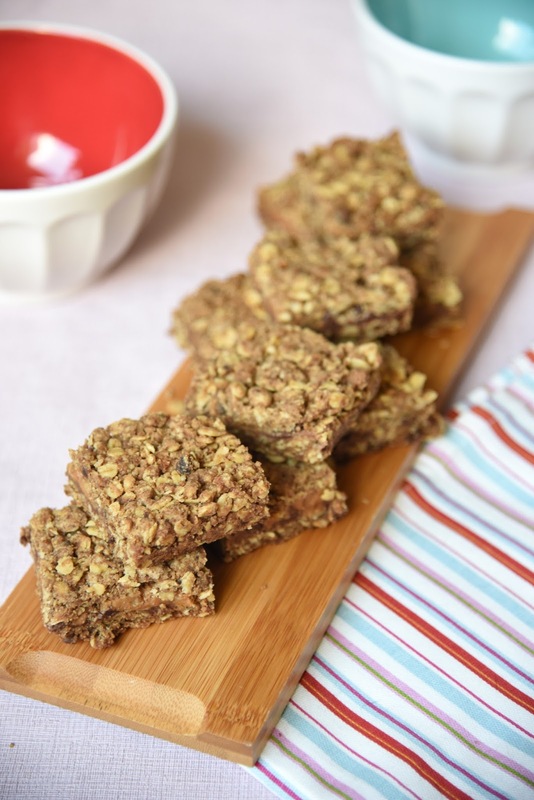 They're so tasty, the mix between the soft caramel and the crunchy oat topping is so good! 2. Combine all the base ingredients in a bowl until evenly distributed. Set aside half the mixture, then press the rest into the bottom on the prepared tin. Bake for 10-12 minutes until lightly brown, leave to cool for 10 minutes and leave the oven on. 3. Mix together the caramel and flour for the filling and set aside. 4. On top of the cooled base sprinkle the pecans or mixed nuts and chocolate chips. Dollop the caramel over and spread over the nuts and chips. Don't take the caramel all the way to the sides or it will stick to the pan. Sprinkle over the reserved crumb dough over the caramel. 5. Bake for an additional 18-20 minutes, until golden brown. Let the bars cool completely in the pan before cutting.